- The registration KEY for this Pack works with the Prepar3D version of FSFlyingSchool PRO 2013. - Extends the options and functions of your built in FSFlyingSchool 'On Approach' features! With the addition to FSFlyingSchool of the Advanced Approaches Pack, you'll be setting up a whole new level of complex approaches in seconds. Here are the NEW features you can use to set up your instant approaches! - A new feature lets you set up an approach which intersects your final approach from any angle you choose. This was previously limited to 45 degrees. 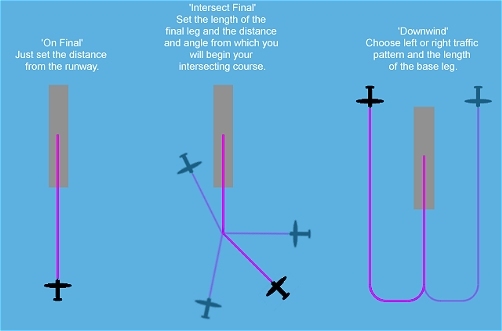 - Begin your approach at the start of the 'Downwind' leg of the traffic pattern at any runway. Fly left or right traffic - the choice is yours! - Optionally set the specific altitude of your approach using MSL or now AAL (Above Airfield Level). Very useful to quickly set 'pattern altitude'. Random runways at detailed airports only please! - Now you can specify that only the slick 'detailed' airports supplied with FSX Deluxe or FSX Acceleration will be included in random selection. - The Flight Plan screen now includes a handy detailed diagram showing which approach types are available to set up with FS Instant Approach PRO at your selected runway. - For those who like variety and challenges, the wind can now be set to a random strength and direction. This will keep you on your toes and is a great way to fly a whole host of very different approaches in minutes. - Low visibility is always a challenge - now you can set it to a random distance that will automatically vary with each new approach! Who knows what you will be facing next time?